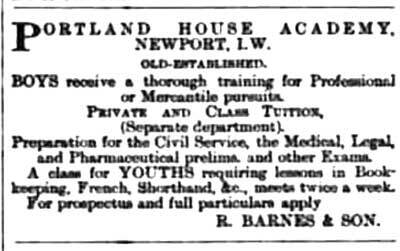 The Portland House Academy was established by Robert Barnes in 1865 in Portland House - it later moved to the corner of West Street and Trafalgar Road. Following the death of Robert Barnes in 1894, the school continued under the leadership of his son, Edwin George, until 1928 when the school was closed in anticipation of a road widening scheme and an extension of the Morey & Sons timber yard factory. In the 1898 and 1911 Kelly's Directories, it is recorded as Barnes Robt. & Son, Portland House academy, Trafalgar road & 23 Carisbrooke road. 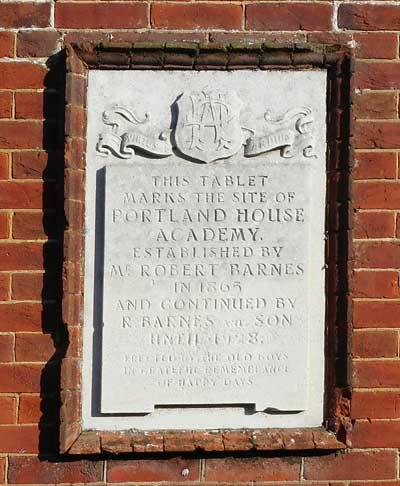 A tablet, on the corner of West Street and Trafalgar Road records the final location of the Portland House Academy, the tablet was erected by some 'old boys'.